Video clip synopsis – For 6 years the two half arches gradually draw closer together. A dream is realised when the heaviest and biggest bridge arch in the world is finally completed. Broadband MP4 shb_bb.mp4 (7.1MB), suitable for iPods and computer downloads. Sydney’s Harbour Bridge Finally Completed is an excerpt from the film Sydney’s Harbour Bridge (8 mins), produced in 1933. Sydney’s Harbour Bridge: Officially opened on 19 March 1932, the Sydney Harbour Bridge was a massive engineering undertaking that transformed the city. This short film documents the construction of one of the world’s great landmarks in its various stages, and provides a fascinaing glimpse of life around Sydney Harbour and Circular Quay in the twenties and thirties. Sydney’s Harbour Bridge was filmed over several years and edited to celebrate the opening. Sydney’s Harbour Bridge was produced by the Department of Commerce. The city of Sydney grew on two opposite sides of a harbour. By 1923 the two sides could be reached by a short ferry ride, or by a 20 kilometre road trip over the nearest bridge. A new bridge to connect the two was needed. In that year a contract was signed to build a steel arch bridge. This was the strongest design for the money at the time. Construction continued for the next seven years, with workers and materials coming from all over the world. The cantilevers met over the middle of the harbour in 1930. When construction started on the bridge, business was booming in Australia. But by 1929, an economic depression had set in. The bridge helped many during this period, as an average of 1,400 people were employed each year to work on its construction, with many more getting jobs supplying materials like sand and rivets. As the working week was gradually reduced from 48 to 33 hours during the building of the bridge, more people were given jobs working on the bridge. The bridge was finally opened in 1932. The opening was disrupted when a member of the New Guard, Francis De Groot, slashed the ribbon with his sword before the Premier Jack Lang could do it. The bridge has become one of the most internationally recognisable symbols of Australia. Before viewing the video clip, brainstorm and write a definition for the term ‘icon’. Check it using a dictionary. The Sydney Harbour Bridge is often described as an ‘Australian icon’. What does this mean? View the video clip with the sound turned off. List, in point form, what is happening in the video clip. View the video clip again with the sound on. Describe how this changes your impression of what’s happening in the video clip. 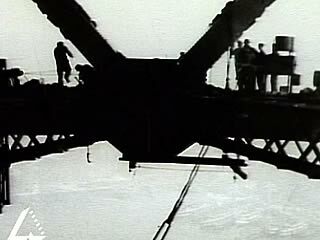 Sixteen workers fell to their death building the bridge. Describe the working conditions on the bridge and give reasons why you think there were not better safety conditions. Imagine that you have been asked to create a new 400-word voice-over narration for this video clip. List the aspects of the bridge that you would like to see covered — for example why it was built, who built it and how, what it felt like when it was built, etc. Use information from the video clip as well as your own research to write the new narration. Make sure you mention the term ‘Australian icon’. Present your narration to the class by reading it out loud while the video clip is being played, with the sound turned off.